Coming into South Africa, after having crossed half of Africa, comes as a high impact shock. It is like riding the bicycle at maximum speed and crash against a concrete wall that we couldn't see in front of us. It is so confusing to come into an African country that has it all: national and rural roads paved as silk, signals everywhere so you don't get lost, distance markers, electricity,running water coming out of taps, sewage system, showers, vehicles in good condition, order, boutique supermarkets where you can get any thing you want. This is more than one can take after 10 months of scarcity. I can't help but wonder: where is it that I am? Where is Africa?. And maybe it was at that very moment that I had to accept that Africa had temporarily stayed behind. 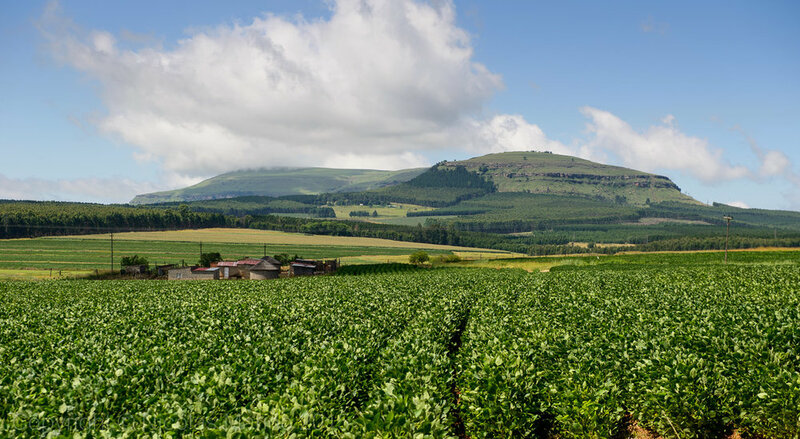 I entered South Africa through its eastern province, Kwazulu-Natal, a beautiful region of fertile undulating fields that extend all around you until vanishing into the horizon. I don't see people soaked in sweat working the land by hand under a punishing sun anymore, like it is in the rest of Africa. Here, I keep passing hectares after hectares of fields treated with the latest technology. Irrigation towers, harvest machinery, automatic packing tractors, all the machinery that you can see in any other developed country. All green patched of different crops in different shades are neatly planted. South Africa isn't really Africa or at least it does not look like it. It is in part, a portion of the first world, and in part, the rest of the Africa, all condensed within the same country, with a great proportion of Asians going into the mix as well. As a result, it is not by chance then, that South Africa as a country, is the melting pot of one of the most complicated racial experiments existing until this day and with a history that is as complex as aberrant sometimes. It is a land where white people of European descent coexist with black Africans from dozens of indigenous tribes,a huge population of Asians mostly coming from the Indian sub-continent that have been here from up to 6 generations,tens of thousands of migrants from the rest of Africa to come in hear in search of a better life and finally and ever-growing population of Chinese. South Africa is exactly what its nickname call it: a rainbow nation, but it is a rainbow where there not always a pot of gold coins to be found at the end of it. Cycling across this country is delightful, even along the rural roads that I choose in order to avoid the traffic of heavy vehicles transiting between the big cities. In addition, this stretch along Kwazulu Natal connecting my way between Swaziland and Lesotho lies comfortably at an average altitude of 1200 m,thus making the climate as pleasant as an eternal spring,just as beautiful as what I had experienced in Zimbabwe. My first encounters with South Africans had already occurred before arriving here. I had already read a lot that has been written by other cyclists about the terrific hospitality of South Africans, but really, after having visited some of the most hospitable countries in the world like Tibet, Mongolia, Sudan, Iran, Indonesia, Uzbekistan among others, I never thought I'd be surprised.The first encounter happened one morning back in Zimbabwe, when a Landcruiser with Johannesburg plates passed me going in the opposite way. A few minutes after that it passed me again but now on the same direction I was going until it stopped 200 m ahead of me. A father and a son got off the truck and waited for me until got where they were. The fathers exclaimed loud in thick Afrikaans accent: "Good morning, may I offer you a cold drink?!" Of course I replied and while he went around the back of the truck to fetch the drinks, he and his son who were on a fishing trip asked me with enormous curiosity about my adventure.In between, the father interrupts and asks: Are you hungry now?Have you had breakfast already?. I told him the story of how I hadn't actually eaten dinner last night and breakfast this morning because the night before my stove had died on me and I took the opportunity to ask him where in South Africa would I be able to get a new one. He didn't say anything and went back to his truck, and while he starts pulling out lots of food and drinks to give me he says: "about your stove, you don't have to get a new one because I am going to give you mine, which is almost new". I was so surprised and went..."what? oh no, do not worry, I can get survive until then and get a new one, it is not problem, thank you very much". "I insist"he said and continued-"you have to eat well, I don't want you to have any problems and you still have a long way to get to South Africa and here you won't find anything". I had no words to thank him and after a bt more of chit chat and a few photos we said farewell. Weeks later in Mozambique, I met Albé,on a remote idyllic beach on the Indian ocean. After having spent some time together chatting about our respective adventures, I told him that I was planning to camp on the beach because guest-houses were way too overpriced and beyond my budget. Albé refused: "No way,come to the one where I'm staying and camp where I'm camping, I'll pay it for you and don't even waste your time trying to refuse". Not only Albé paid for the 11 usd per night that the camping cost but every day he would insist in feeding me with lunch and dinner, because according to him, I was too thin and had too eat. I kept refusing politely but to no avail. These were the first two examples of something that would repeat over and over again along the whole way across South Africa. People would stop their vehicles to chat and offer me food and drinks. The most common was : May I offer you a cold drink?. Other people would be too concerned about my safety so they would pay mea hotel room to stayso I wouldn't have to camp. Some others would buy me lunch or dinner and others woulddonate their moneyto contribute to my adventure.Other times, the mostusualreplyI got to my "May I camp here? - would be- Yeah sure, but why, you have a room in our houseandyou are welcome to stay and eat with us. Hospitality was overwhelmingin the most positiveway, because it is not onlythe offering ofa comfortable meal and abundant meals but the profound interestwith which people approach you. The exchange that comes as a result of it is extremely beautiful. Whetheris the whites, the blacks, the "colored", the indians, pakistanes, etc, all of them without exception, would offer me their most dedicated and heartfelt hospitality. Cycling across Kwazulu Natal was extremely pleasant. It was not only the human warmth of these South Africans but also the dazzling landscape of the lower lands of the Drakensberg range, the Midlands Meander.I spent three days resting there at Charles and Leslie's magnificent300 hectars farm, before setting of to Lesotho. They welcomed meas though I was their own son and spoiled me as such. The undulating hills, the terrific sunsets and colored skies,the hazy horizons, the European-like tidiness, it all felt like a dream. There, in that magnificent scenery, so auspicious to let the body and mind rest, I took time to reflect about my life. I regained the energies I needed to embark on one of the toughest stretches of this trip so far, riding across the tiny mountain Kingdom of Lesotho. What I did not know there yet is that soon after those days of peace and serenity I would find myself unexpectedly face to face with death.